A trauma-informed yoga and mindfulness program helps over 700 women cultivate self-confidence, clarity, and peace. The program consists of asana, group discussion, and guided meditation centered on a different emotional theme in each of 16 weekly sessions. The nonprofit yogaHOPE has been offering yoga classes to women in transitional centers—drug rehabs, domestic-abuse safe houses, homeless shelters, and a prison—for five years. Jones, 46, created the organization following a dark period in her own life. In 2005, she was depressed and suicidal, and yoga, which she had recently taken up, helped her through the difficult time. She began to think about other women who were feeling hopeless and how yoga might support them too. 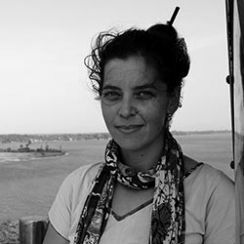 Amy Karafin is a writer, editor and translator. She is the co-author of the Lonely Planet travel guides India and South India.